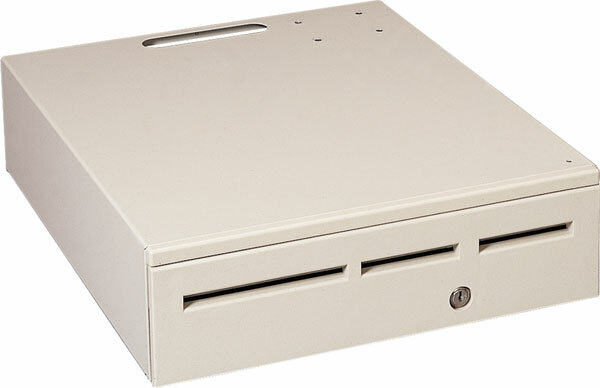 MediaPLUS, 17" W x 16" D x 5" H, 3 media slots, universal interface (compatible with all 24 volt receipt printers). Includes bill tray. Order cables separately. See accessories. Color: black. MediaPLUS, 17" W x 18" D x 5" H, 3 media slots, universal interface (compatible with all 24 volt receipt printers). Includes bill tray. Order cables separately. See accessories. Color: black. MediaPLUS, 17" W x 20" D x 5" H, 3 media slots, universal interface (compatible with all 24 volt receipt printers). Includes bill tray. Order cables separately. See accessories. Color: black. Under Counter Mounting Heavy duty steel brackets are available for below counter mounting.